The Annals of Pediatric Endocrinology & Metabolism Journal is the official publication of the Korean Society of Pediatric Endocrinology. Its formal abbreviated title is “Ann Pediatr Endocrinol Metab”. It is a peer-reviewed open access journal of medicine published in English. The journal was launched in 1996 under the title of ‘Journal of Korean Society of Pediatric Endocrinology’ until 2011 (pISSN 1226-2242). Since 2012, the title is now changed to ‘Annals of Pediatric Endocrinology & Metabolism’. The Journal is published four times per year on the last day of March, June, September, and December. It is widely distributed for free to members of the Korean Society of Pediatric Endocrinology, medical schools, libraries, and academic institutions. The journal is indexed/tracked/covered by web sites of PubMed Central, PubMed, Emerging Sources Citation Index (ESCI), Scopus, EBSCO, EMBASE, KoreaMed, KoMCI, KCI, Science Central, DOI/CrossRef, Directory of Open Access Journals(DOAJ), and Google Scholar. The aims of Annals of Pediatric Endocrinology & Metabolism are to contribute to the advancements in the fields of pediatric endocrinology & metabolism through the scientific reviews and interchange of all of pediatric endocrinology and metabolism. It aims to reflect the latest clinical, translational, and basic research trends from worldwide valuable achievements. In addition, genome research, epidemiology, public education and clinical practice guidelines in each country are welcomed for publication. The Journal particularly focuses on research conducted with Asian-Pacific children whose genetic and environmental backgrounds are different from those of the Western. Acceptance for publication of submitted manuscript is determined by the editors and peer reviewers, who are experts in their specific fields of pediatric endocrinology and metabolism. The journal includes the following sections: current opinions, review articles, original articles, case reports, editorial and letters to the editor. The editorial board invites articles from international studies or clinical, translational, and basic research groups. Supplements can be published when they are required. The Journal adheres to the guidelines and best practices published by professional organizations, including Recommendations for the Conduct, Reporting, Editing, and Publication of Scholarly Work in Medical Journals (http://www.icmje.org/icmje-recommendations.pdf) from ICMJE and Principles of Transparency and Best Practice in Scholarly Publishing (joint statement by COPE, DOAJ, WAME, and OASPA; http://doaj.org/bestpractice/). Conflict of interest exists when an author or the author’s institution, reviewer, or editor has financial or personal relationships that inappropriately influence or bias his or her actions. Such relationships are also known as dual commitments, competing interests, or competing loyalties. These relationships vary from being negligible to having great a potential for influencing judgment. Not all relationships represent true conflict of interest. On the other hand, the potential for conflict of interest can exist regardless of whether an individual believes that the relationship affects his or her scientific judgment. Financial relationships such as employment, consultancies, stock ownership, honoraria, and paid expert testimony are the most easily identifiable conflicts of interest and the most likely to undermine the credibility of the journal, the authors, or of the science itself. Conflicts can occur for other reasons as well, such as personal relationships, academic competition, and intellectual passion (http://www.icmje.org/conflicts-of-interest/). If there are any conflicts of interest, authors should disclose them in the manuscript. The conflicts of interest may occur during the research process as well; however, it is important to provide disclosure. If there is a disclosure, editors, reviewers, and reader can approach the manuscript after understanding the situation and background for the completed research. For clinical studies with human subjects, authors must state in their Materials and methods section that they have received informed consent from participants as well as IRB approval for their study or that they have obtained a statement from the IRB that approval and/or informed consent was unnecessary. In the submission of selected series, such as case reports, that have no Materials and methods sections, authors must address IRB approval in the main text of the manuscript. If there is any particular reason not to obtain informed consent, the authors should state the basis for the exemption. Even when the study has been exempted from IRB approval, the IRB approval or registration number should still be included in the original article and case report. If necessary, the editor or reviewers may request copies of these documents to resolve questions about IRB approval and study conduct. Any research that deals with a clinical trial should be registered with the primary national clinical trial registry site such as the Korea Clinical Research Information Service (CRiS, http://cris.nih.go.kr), other primary national registry sites accredited by the World Health Organization (http://www.who.int/ictrp/network/primary/en/) or ClinicalTrials.gov (http://clinicaltrials.gov/), a service of the United States National Institutes of Health. Authorship credit should be based on: 1) substantial contributions to conception and design, acquisition of data, or analysis and interpretation of data; 2) drafting the article or revising it critically for important intellectual content; 3) final approval of the version to be published; and 4) agreeing to be accountable for all aspects of the work in ensuring that the questions related to the accuracy or integrity of any part of the work are appropriately investigated and resolved. Authors should meet these 4 conditions. If the number of authors is greater than 6, there should be a list of each author's role in the submitted paper. If any persons who do not meet the above four criteria, they may be placed as contributors in the Acknowledgments section. Description of co-first authors or co-corresponding authors is also accepted if the corresponding author believes that such roles existed in contributing to the manuscript. When the Journal faces suspected cases of research and publication misconduct such as a redundant (duplicate) publication, plagiarism, fabricated data, changes in authorship, undisclosed conflicts of interest, an ethical problem discovered with the submitted manuscript, a reviewer who has appropriated an author’s idea or data, complaints against editors, and other issues, the resolving process will follow the flowchart provided by the Committee on Publication Ethics (http://publicationethics.org/resources/flowcharts). The Editorial Board of APEM will discuss the suspected cases and reach a decision. APEM will not hesitate to publish errata, corrigenda, clarifications, retractions, and apologies when needed. Authors should submit manuscripts via APEM’s electronic manuscript management system. All reviewing and editing is also performed via this system. Please log in first as a member of system and follow the directions. Manuscripts should be submitted by the corresponding author, who should indicate the address and phone number for correspondence on the title page of the manuscript. If available, a fax number and e-mail address should be included. The revised manuscript should be submitted through the same web system under the same identification numbers. 1) To submit your manuscript, go to http://www.e-apem.org. Instructions for online submission are located on this website. 2) There are no author submission fees or other publication-related charges. All cost for the publication process is supported by the Publisher. APEM is a so-called platinum open access journal which does not charge author fees. 3) Confirmation of receipt will be issued when the submission process is complete. The receipt can be downloaded from website. - Click the electronic submission at http://www.e-apem.org. - Choose the appropriate format (original article, case report, review) of your manuscript. - Complete the author's manuscript checklist according to your type of manuscript. If you can't complete it then do not move to the next step. - Fill in the information about the authors, and relevant contact information. - Fill in the title, affiliations, authors, and abstract. - The status of the manuscript may be viewed on the homepage. APEM reviews all received materials. Manuscripts are sent to the two most relevant investigators available for review of the contents. The editor selects peer referees by recommendation of APEM’s editorial Board members or from the Board`s specialist database. General scheme is presented in Fig. 1. Fig. 1. 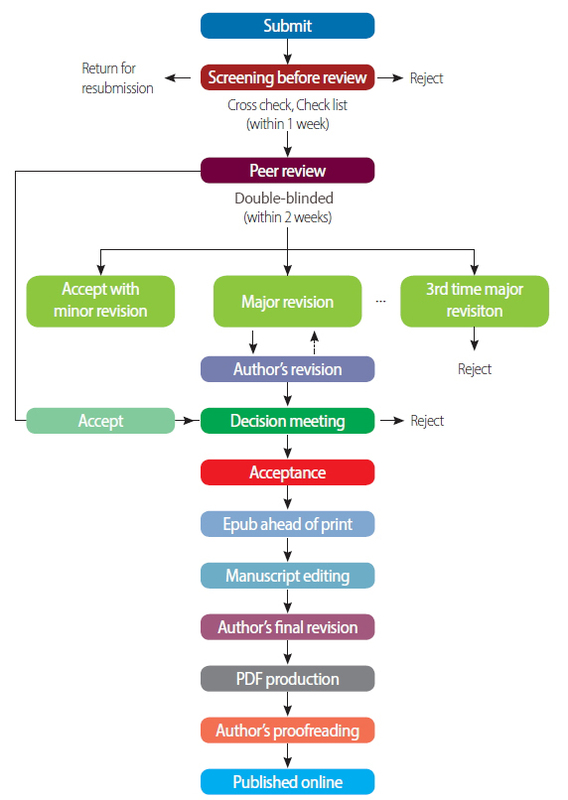 Flow chart of the peer review and publication process of Journal of Educational Evaluation for Health Professions. 2. Revision of proof and publication. After corrections have been made, the accepted manuscript will be sent to the publisher for printing. The proof pages may be revised more than once by the corresponding author, if it is necessary. The author should double-check for corrections in the content, title, affiliation, capitalization, locations of figures, and references. Corresponding authors are responsible for further corrections made after printing. 4. How the journal handle complaints and appeals. Submitters, authors, reviewers, and readers may register complaints and appeals in a variety of cases as follows: falsification, fabrication, plagiarism, duplicate publication, authorship dispute, conflict of interest, ethical treatment of animals, informed consent, bias or unfair/inappropriate competitive acts, copyright, stolen data, defamation, and legal problem. If any individuals or institutions want to inform the cases, they can send a letter via the contact page on our website: https://e-apem.org/about/contact.php. For the complaints or appeals, concrete data with answers to all factual questions (who, when, where, what, how, why) should be provided. A minimum of 100 off prints will be delivered after payment. Reprints are available at any time after publication; however, reprints ordered after publication may be subject to increases in price. The corresponding author will be requested to pay a page charge and color photographs require an additional fee. Once the manuscript is at the publisher, confirmation of acceptance by the APEM may be issued. For registration for board exams, a receipt of confirmation with two reprints may be ordered for the accepted manuscript. An additional fee is required for these reprints. d. Case reports of previously published cases will not be accepted. The editorial board will make an exception only if the case is very rare. The APEM index should be reviewed before the submission of case reports. APEM is an open access peer-reviewed journal and launched in 1996. All articles published in APEM will be immediately and permanently free for everyone to read and download. All articles are distributed under the terms of the Creative Commons Attribution Non-Commercial License (http://creativecommons.org/licenses/by-nc/4.0/) which permits unrestricted non-commercial use, distribution, and reproduction in any medium, provided the original work is properly cited. (https://www.ncbi.nlm.nih.gov/pmc/journals/2434/) from the 18th volume, 2013. According to the deposit policy (self-archiving policy) of Sherpa/Romeo (http://www.sherpa.ac.uk/), authors cannot archive pre-print (i.e. pre-refereeing), but they can archive post-print (i.e. final draft post-refereeing). Authors can archive publisher's version/PDF. APEM provides the electronic backup and preservation of access to the journal content in the event the journal is no longer published by archiving in PubMed Central. Journal propagation has been done through the journal website and distribution of an introduction pamphlet. Invitations to submit a manuscript are usually focused on the presenters at conferences, seminars, or workshops if the topic is related to the journal's aims and scope. 1. Annals of Pediatric Endocrinology & Metabolism publishes review articles, original articles, case reports, and news. Review articles may be written by invitation by the editorial board and provide concise reviews of important subjects to medical researchers. Original articles are papers reporting the results of basic or clinical investigations, which are sufficiently well documented to be acceptable to critical readers. Case reports deal with cases of importance issues in pediatric endocrinology. 2. The manuscript should not have been published previously, and not have been submitted for publication elsewhere. Any conflicts of interest of all listed authors should be stated. 3. The manuscript should be written according to the prescribed format. If not, the editorial board may return it before reviewing. The editorial board decides on publication and may modify a portion of the text with little effect on the original. 4. The manuscript must be written in English. If a translated term is difficult to understand, Chinese characters or the original language in parentheses should be written at first use. 5. The text of the manuscript, including tables and their footnotes and figure legends, must be double-spaced and in standard 12-point font on A4 paper size with left and right margin spaces of 2 cm and top and bottom margins of 3 cm. 6. Except for units of measurement, abbreviations are strongly discouraged. Do not use abbreviations in the title or abstract and limit their use in the text. Expand all abbreviations at first mention in the text. 7. Measurements of length, height, weight, and volume should be reported in metric units (meter, kilogram, or liter) and laboratory values should be displayed in International System of Units (SI). 8. The number of pages of manuscripts of reviews and original articles has no limitation but no more than 10 printed pages are recommended. Case reports should be written in a maximum of five 5 printed pages. The manuscript should be prepared according to “Uniform Requirements for Manuscripts submitted to Biomedical Journals” (2008) (http://www.icmje.org). The manuscript should have the following sequence: Title page, Abstract and Key words, Introduction, Materials and Methods, Results, Discussion, Acknowledgment, References, Tables, and Figure Legends. The format of case reports consists of Introduction, Case, and Discussion. All pages should be numbered consecutively in the middle of the bottom margin, starting with the title page. If a manuscript is written in English, authors (particularly non-native English speakers) who submit the original article or case report should check their manuscript by using professional editing service and submit the manuscript with a certificate of English review, including the name, institution, position, statement of approval, and signature with unstructured format. The tile page should contain the following information: (1) title; (2) author list (full names of authors); (3) name of the institutions at which the work was performed; (4) acknowledgement of research support; (5) name, address, telephone, fax number, and e-mail address of the corresponding author; (6) A running title, of 10 words or less, should be written when the main title is over 30 words. All articles should include abstracts in English. The abstract should be a single paragraph of less than 250 words, and describe concisely, the purpose, methods, results, and conclusion of the study, in a structured format. Abstracts of case reports may have an unstructured format with the same restriction on word count. Abbreviations, if needed, should be kept to an absolute minimum, and their first use should be preceded by the full term in words. The abstract should not include footnotes, references, or tables. The abstract can be modified by an English language reviewer who is appointed by the editorial board. A maximum of 10 key words should be listed at the end of the abstract to be used as index terms. For the selection of key words, refer to Medical Subject Headings (MeSH) in Index Medicus, or http://www.nlm.nih.gov/mesh/MBrowser.html. The materials and study design should be presented in detail. In experimental research, methods should be described in such a manner that the experiments can be reproduced by the readers. The sources of special chemicals or preparations should be given ( name of company, city and state, and country). Clinical studies or experiments using laboratory animals or pathogens should include approval of the studies by relevant committees. A statement concerning IRB approval and consent procedures must be presented. The discussion should focus on the interpretation and significance of the findings and include the objective comments that describe their relation to other work in the area as well as new and important aspects of the study. The Discussion should not repeat materials already presented in the Results section. References must be written in English only. Reference citations in the text should be made with consecutive numbers in parenthesis (Vancouver style). References should be listed in the order of citation in the text, with the corresponding number. The reference style for journal articles is as follows : names of authors, full title of article, journal name abbreviated in accordance with Index Medicus, year, volume, and page numbers. List all authors when they are six or less; when they are seven or more, list the first six and add et al. The names of all authors must be listed by the last name and the initials of the first and middle names. Papers in press may be listed with the journal name and tentative year of publication. The style for a chapter of a book is as follows: author and title of the chapter, editor of the book, title of the book, edition, volume, place, publisher, year, and page numbers. Unpublished data or personal communications are listed only with the author’s written permission. Internet URLs should be as follows; authors’ names, website title, URL and the time of the latest update. All other references should be listed as shown in the “Uniform Requirements for Manuscripts submitted to Biomedical Journals” (2008). Authors are responsible for the accuracy and completeness of their references. The maximum number of cited references should be 40 for original articles and 20 for case reports. Yoon JY, Kang MJ, Kim SY, Seo JY, Yang SW, Lee YA, et al. The relationship between initial body mass index and body mass index after one year of gonadotropinreleasing hormone agonist therapy in idiopathic true precocious puberty girls. J Korean Soc Pediatr Endocrinol 2011;16:165-71. Wheless JW, Treiman DM. The role of the newer antiepileptic drugs in the treatment of generalized convulsive status epilepticus. Epilepsia 2008;49 Suppl 9:74-8. Gardos G, Cole JO, Haskell D, Marby D, Paine SS, Moore P. The natural history of tardive dyskinesia. J Clin Psychopharmacol 1988;8(4 Suppl):31S-37S. Nikitovic M, Wodchis WP, Krahn MD, Cadarette SM. Direct health-care costs attributed to hip fractures among seniors: a matched cohort study. Osteoporos Int In press 2012. Volpe JJ. Neurology of the newborn. 2nd ed. Philadelphia: WB Saunders Co, 1987:209-79. Ahn HS. Hong chang yee textbook of pediatrics. 10th ed. Seoul: Mirae N Co., Ltd, 2012:965-78. Pan ES, Cole FS, Weinttrub PS. Viral infections of the fetus and newborn. In: Taeusch HW, Ballard RA, Gleason CA, editors. Avery’s diseases of the newborn. 8th ed. Philadelphia: Elsevier Saunders, 2005:495-529. Vivian VL. editor. Child abuse and neglect: a medical community response. Proceedings of the First AMA National Conference on Child Abuse and Neglect; 1984 Mar 30-31; Chicago. Chicago: American Medical Association, 1985. Youssef NM. School adjustment of children with congenital heart disease(dissertation). Pittsburgh (PA):Univ. of Pittsburgh, 1988. Polgreen PM, Diekema DJ, Vandeberg J, Wiblin RT, Chen YY, David S, et al. Risk factors for groin wound infection after femoral artery catheterization: a casecontrol study. Infect Control Hosp Epidemiol [Internet] 2006 [cited 2010 Jan 5]; 27:34-7. Available from: http://www.journals.uchicago.edu/ICHE/journal/issues/v27n1/2004069/2004069.web.pdf. On Ministry for Health, Welfare and Family Affairs. The Third Korea National Health and Nutrition Examination Survey (KNHANES III) [Internet]. Seoul: Ministry for Health, Welfare and Family Affairs; 2006 [cited 2006 Jul 8]. Available from: http://knhanes.cdc.go.kr. 1) Tables should be written in English. Each table should be inserted on a separate page, with the table number, table title and legend above the table. 8) Table footnotes should be indicated with superscript symbols in sequence : *, †, ‡, §, ||, ¶, **, ††, ‡‡, etc. 1) All the legends for figures should be written in English. 2) Figures should be submitted separately from the text the manuscript. All pictures and photographs should be of excellent quality and supplied as JPEG or TIFF files with resolution of more than 300 dpi. The preferred size of figure is 7.4 × 10.0 cm (3 × 4 inches). Except for particularly complicated drawings that show large amounts of data, all figures are published at one page or one column width. All kinds of figures may be reduced, enlarged, or trimmed for publication by the editor. 3) Color figures and pictures will be published if the editor decides it is absolutely necessary. However, the additional cost must be covered by the authors. 4) Figure numbers, in Arabic numerals, should appear in the figure legends. Arabic numerals should be used in the orderin which the figures are referred to in the main text. In cases where more than two photographs are used with the same number, alphabet characters should be used next to the Arabic numeral (e.g. : Fig. 1A, Fig. 1B). 5) All pictures and photographs should be described in the legend with complete sentences rather than incomplete phrases or a clause. 6) All symbols and abbreviations should be described below the figure. New Manuscripts should be submitted online at the following URL: http://submit.e-apem.org. ID should be your email address being actively used now. If you have an account but forgot your password, click the "Forgot Your Password?" button. Your password will be given to your email address on your request. To begin, enter your User ID and password into the boxes provided, and click. At the welcome screen, click "Submit a Manuscript" button. After that, click "New Submissions" button to submit your new manuscript and follow steps 1-7. 1. Manuscript is double-spaced with 12-point font. 2. The order of the manuscript is title page, abstract and keywords, introduction, materials and methods, results, discussion, acknowledgments, references, and tables and figure legends. All pages are numbered consecutively starting from the title page. 3. The title page include article title, authors’ full name(s) and affiliation, address for correspondence (including telephone and fax numbers and e-mail address), running title (less than 10 words), and footnotes, if any. 4. The Abstract has structured format for original articles and an unstructured format for case reports with maximum of 250 words, including key words as in MeSH. 5. The word count is for the main text only, exclusive of title, abstract, references, tables, and figure legends is presented on the title page. 6. All tables and figure numbers should be found in the text. 7. The reference items are listed in the correct format and all references listed in the references section are cited in the text. 8. The covering letter states that the manuscript has not been published previously, and will not be submitted for publication elsewhere. It discloses conflicts of interest of all listed authors, if any. 9. A title for each table and figure is written in a brief phrase of 10 to 15 words. 10. All authors must read the manuscript and agree with the submission.